Wolf Comes To Town by Denis Manton must be one of the most underrated children’s book on the Internet. I was genuinely astonished to check out what others have said about this picture book on Amazon and Goodreads. Both sites show a 1.5 star average rating at time of writing. Can you guess what reviewers don’t like about this book? A. The story is poorly written and edited. B. The illustrations are amateurish. C. Not suitable for children due to the main character behaving badly and not going punished. This book is terrible, it should not be in print. The wolf eats the dogs and cats and then the little boy in it is praised for suggesting the wolf should be burnt and have his head cut off. He is promptly told what a “Brave little boy” he is! Then it is indicated that the wolf has eaten the little boy when the boys mother finds his trousers and is sobbing! There is no good, it will do nothing but corrupt young children. It was given to my young son from his school and this was for me to read to him, but it was a horror story and I’m disgusted that I did just that. I would suggest this book is thrown away! As the blurb says, it’s a book about a wolf who dresses up to fool the towns people..he manages to steal all sorts of things, eat the pets and eventually a little boy (caught whilst dressed as the vicar!). I thought it was funny for a bit- my daughter had some fun spotting the wolf dressed up, but there is no moral come back at all- he runs off with his dressing up clothes to terrorise the next town, and so the story ends on a bit of a down. The language and style suits 3 years plus, but some young children would be upset by it. My copy is in the bin (not the charity shop!). Also- are there no books out there where the wolf isn’t so bad? I could not believe it when my 3 year old brought this horrible story home from school. The wolf steals, eats pet cats, eats pet dogs, and eats a little boy. There is no comeuppance, no moral. There is nothing it indicate to children that his behaviour is wrong. He gets away with it with no punishment. My son was upset by the boy getting eaten. Because there is no real ending to this book. I’m a Children’s Librarian, and I ran across this while looking for books about stealing for a patron. The book starts out well enough; the big bad wolf disguises himself in order to steal whatever he pleases from stores & shops. The townspeople finally find the wolf’s home (while searching for “brave little Bernard,” a young boy the wolf takes), and see all their belongings inside. Everyone claims their things, Bernard’s mother finds her son’s trousers, and the wolf’s clothes are packed up to be given to charity. Only the nurse doing the packing is really the wolf in disguise, and he makes off with the clothes to a new town. That’s the end of the story. There’s no conclusion, the wolf doesn’t get punished for his bad behavior, and the reader doesn’t know if little Bernard is alive or dead. Cute beginning, terrible ending. I would not choose this book for storytime, as a learning tool, or anything else. A wolf lives on the outskirts of a town. He dresses up in all sorts of disguises, then visits the town to steal things he likes and needs. He tends to dress up as trustworthy people: policemen, priests. One day he eats a little boy at a garden party. The townspeople go out looking for Bernard — the wolf among them — and happen across his house, chock full of all the things he has stolen. Wolf manages to prevent his clothes from being thrown out. He takes them in a trolley to the next town, where he will presumably do exactly as he did in this one. Possibly my favourite aspect of this book is the phrase, ‘I like it, I want it and I’LL TAKE IT!’ In oral retellings of Little Red Riding Hood, too, the teller of the story would pounce in playful fashion at the child when the grandma wolf pounced at Little Red. This book is equally well suited to a dramatic retelling between parent and child. Whose town is the wolf in now? Roald Dahl makes use of this kind of fear in his book The Witches, in which the reader is told that even the teacher who is reading this book to you right now might be a witch. I was read The Witches by my teacher when I was six, and I do remember looking at her very closely, concluding she couldn’t be because she wasn’t wearing gloves. In common with various famous fairytales — Little Red Riding Hood springs first to mind — readers are warned not to take people at face value. The beautiful young woman is really a wolf. The policeman is really a wolf. The vicar is really a wolf. Although the classic tales have been watered down for modern children — starting with Grimm and completed by Disney — this story harks back to the pre-Grimm days, in which villains were not punished. In these days of Occupy Wall Street, which is the more important lesson for young readers? In real life, villains most often do go unpunished. They dress in respectable clothes and walk among us. Especially disturbing, against the comic line ‘Little Bernard’s little trousers!’ is the art gallery owner who is far more interested in his stolen painting than in this mother’s missing son. In storybooks as in real life, sometimes we get our priorities wrong. The main challenge for Denis Manton in illustrating this work would have been to depict a wolf who looked sufficiently like a person when dressed up like one. He has risen to this challenge by turning the snout into a large nose. The milkman (wolf) has a larger than average nose. Because of this challenge, the loose, sketchy style works best. When the style is loose like this, the wolf looks different every time we see him, but the reader can put this down to the style, and accept it’s the same creature. The sketchy style is also fitting for the generally chaotic scenes: the wolf’s messy abode, scenes of people screaming and running away, scenes with lots of movement etc. Written and illustrated by Australian Denis Manton in 1994, this book is now hard to get, possibly helped along its way to obscurity to the large numbers of adult gatekeepers who refused to buy or recommend this story. Manton seems to have illustrated more books than he wrote, and the books that he wrote seem to have fallen out of print, including Anastasia, published 1979. Another picturebook which has certain adult readers up in arms is This Is Not My Hat by Jon Klassen, also accused of having ‘no repercussion for stealing’ and ‘no definitive ending’. This retelling of Little Red Riding Hood garners some similar comments regarding its suitability for children. 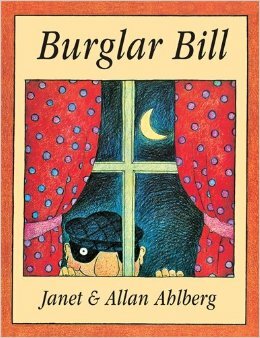 Burglar Bill lives by himself in a tall house full of stolen property. Every night he has stolen fish and chips and a cup of stolen tea for supper. Then he swings a big stolen sack over his shoulder and goes off to work, stealing things.